The original structure was expanded 4 feet to the right to accommodate a larger kitchen with generous clearances for a functional island. This three-level Bellevue residence — a builder home erected about 10 years ago — underwent a comprehensive expansion and upgrade. A living space that was less generic and more functional and intimate, better suited to their daily routine, with better articulated spaces and storage placed and organized to prevent clutter. 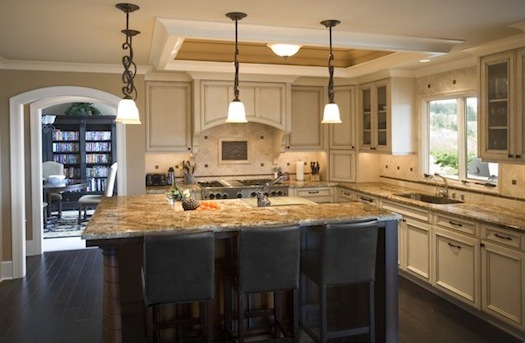 A larger, more functional kitchen. A covered deck with protection from the sun and rain. 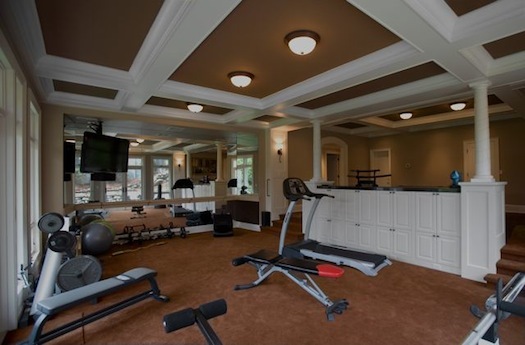 An exercise area and home theater. New appliances, cabinetry, and finishes throughout. To provide more floor space on the main and lower levels, 3.5 feet were added along the south side of the house and a covered deck was built out from the main level. The entire structure was reestablished and cantilevered off the existing foundation, using glue-laminated beams. The roofline was also reworked to make the expansion appear seamless, as though the house had originally been built that way. 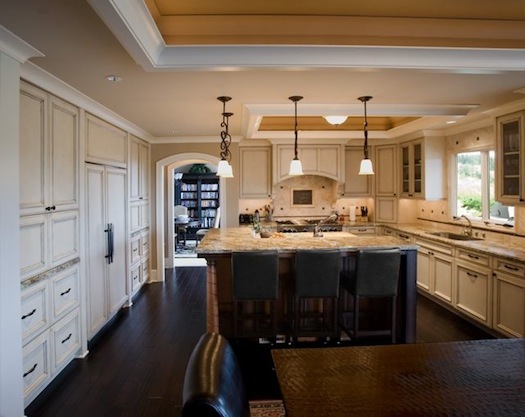 On the main level, the enlarged footprint allowed the complete reconfiguration of the kitchen and family dining and living areas, with coordinated remodeling of the existing entry and formal areas. In the expanded daylight basement on the lower level, there was enough space under the new deck for an exercise area and home theater. 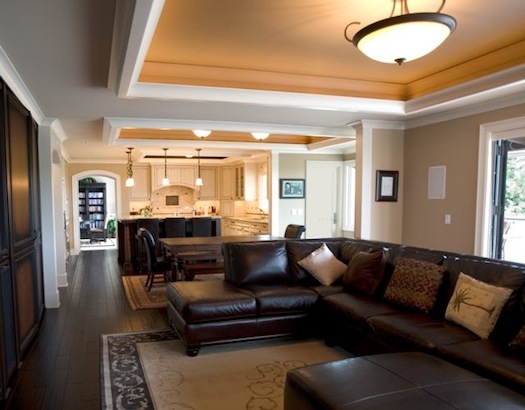 Existing spaces, including a rec room, guest room, and kitchenette, were adapted and upgraded. CASA handled space pre-design for the dedicated home theater. The actual theater design and installation were contracted out to a specialist. There was also remodeling in the upper level, primarily to repurpose an underused common area. This allowed doubling the size of the master suite’s walk-in closet, and expanding a child’s bedroom into a small suite, complete with a new bathroom, a walk-in closet, and a bay window with built-in seats and storage. Another, existing bathroom was upgraded. Throughout the home, work and storage zones were strategically placed and concealed with door panels and custom cabinetry to minimize clutter in the main areas. Other improvements included replacing the front porch columns and the banister for the main stairs. The remodeled spaces are virtually new construction with new plumbing, lighting, cabinets, appliances, and surface finishes. The other side of the kitchen features custom cabinetry concealing a refrigerator plus pantries and appliance garages on either side. 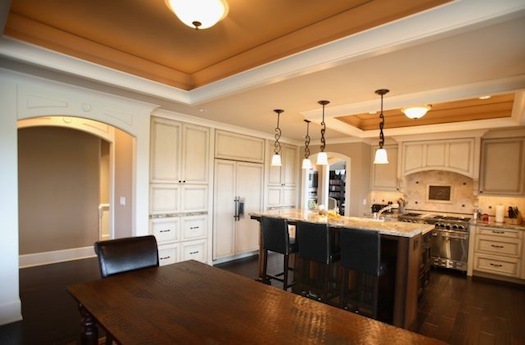 View of the kitchen from the family dining area, with a peek at the formal dining area through the back doorway. 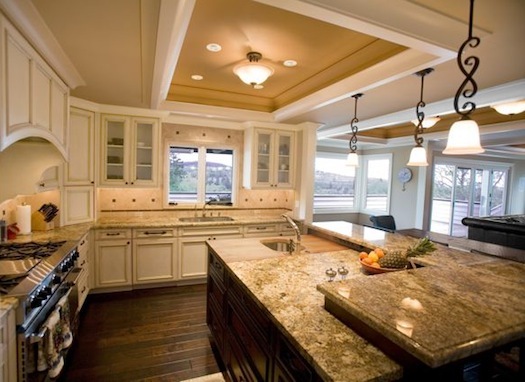 The island was positioned and configured to match the cooking style and work flow of the owner, with a chopping-block prep area around the sink and adjacent two-level granite counters, all in easy reach of the stove. The original open layout was widened and articulated with wall offsets and ceiling coffers to define three spaces: a living room, informal dining area, and kitchen. This created additional space, but with a more intimate feeling. A newly constructed covered deck is accessible through the glass doors on the right. 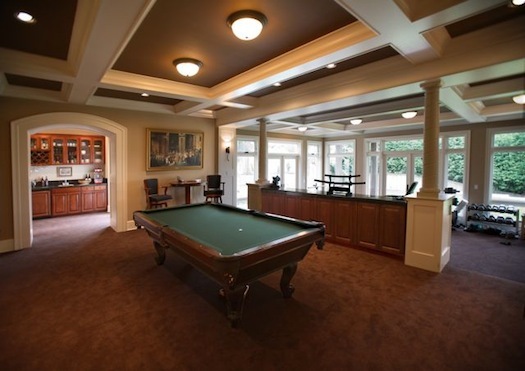 The rec room in the original lower level was reconfigured into a functional pool room, with full 5-foot clearances all around the table. Through the back doorway is a completely updated kitchenette. 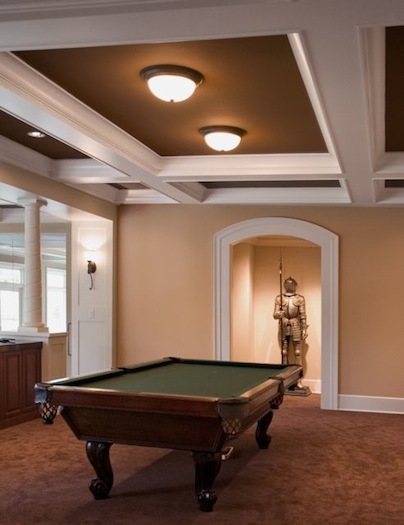 The pool room from the other direction. The arched doorway leads to a hallway with a recessed display area, for the suit of armor, and access to a remodeled guest bedroom and a new home theater. This new exercise area is situated under a new enclosed deck added to the south side of the house. Plenty of space was created for all the exercise stations as well as open stretching areas. 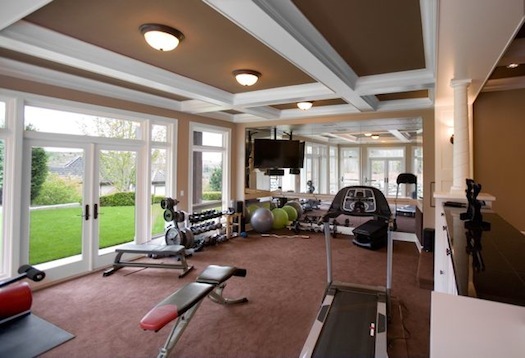 A columned partial wall with custom cabinetry separates the home gym from the pool room.